For the Gopher Gala, we wanted to show how Go could be used to make live web games. 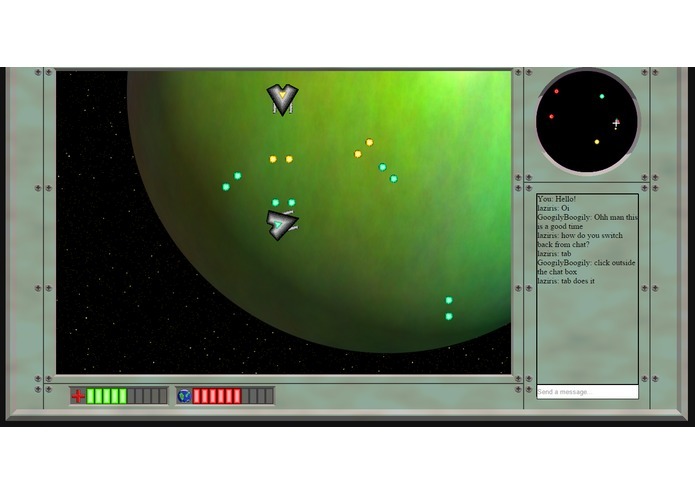 Flash games were very popular but are significantly less interesting than web technology currently allows. Go is the perfect choice for building a back end for multiplayer web games. It's concurrency support and strong standard library allow for quickly and correctly handling the game and server logic required. The gameplay was inspired by bring asteroids like gameplay into a multiplayer context. Users can move around and shoot people in other factions. Additionally, hovering over a planet allows you to capture it for your team. There are pirates which provide entertainment when there isn't enough players for PvP, and they will periodically spawn and try to capture a planet. If there are enough players to support PvP, the game naturally blends into a territory game with the two factions (Gophers Vs Pythons, because why not?) fighting over planetary control. We are proud to have made an online game, which can potentially support many players, in a single weekend. The server handles all of the processing of the game events, and they are passed live to the users. If we had more time, many gameplay elements could be added (such as ship upgrades, larger map, more interesting combat, etc.) which could be built up into a proper multiplayer game with the possibility of revenue. This shows the power of the modern web, and Go's ability to harness it. If you wish to play the game, we highly encourage you to play it with others. It's where the game really shines. If you have access to the gophergala slack, we have created a channel called "gogalamon" which can be used to coordinate times where multiple people can get on and play. Hope you have fun! Note: To get out of the chat window, you must click the chat, not the playing window.